These Bags Come In a Variety Of Colors And Patterns. Let Us Pick One For You! Hippie clothes. Bohemian clothing. Artsy clothing for creative people who aren't afraid to show a little color! 100% cotton patchwork no-match shoulder bag. 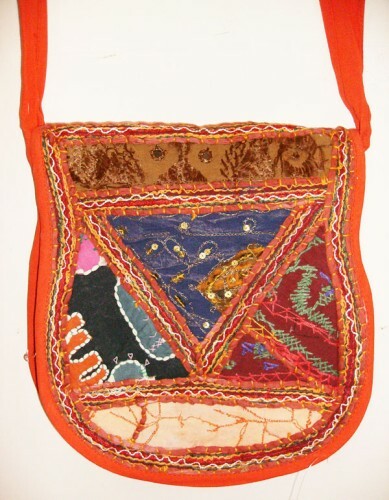 This bag is decorated with lots of embroidery and other fun embellishments. One inch gusset, velcro closure, zipper compartment. The bag is worn over the shoulder and falls about hip length on the average person. A great addition to any Sacred Threads wardrobe. Check the measurements below.